* All rights reserved worldwide. Reproduction in any manner without permission of proprietors is prohibited. MD & CEO, Manappuram Finance Ltd.
Editorial The Calendars are being changed; new diaries are organizers are in front of us waiting to be opened. New Year Resolutions are being decided on. Every New Year brings with it a lot of hope and excitement. Hope that the New Year will also bring great success to you. There is small anecdote which the character played by Christopher Walken says in the film Catch me if you can. “Two little mice fell in a bucket of cream. The first mouse quickly gave up and drowned. The second mouse, wouldn't quit. He struggled so hard that eventually he churned that cream into butter and crawled out. Gentlemen, as of this moment, I am that second mouse.” A story that tells us about the hard work we have to do before we attain success. Miss South India, one of the best beauty pageants in India will be held at Lulu Convention Centre, on the 9th of January 2013. Unique Times will cover this elegant show in a comprehensive manner. Tune to our online edition for instant updates. 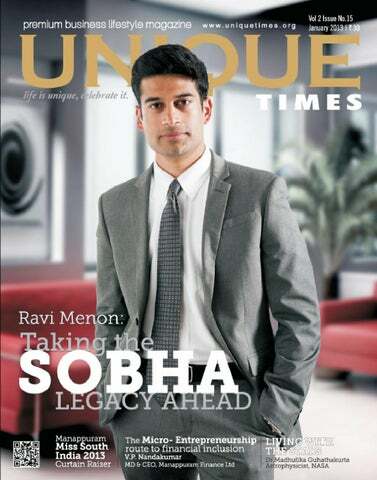 This edition we have an interview with Mr. Ravi Menon, Chairman of Sobha Group. In the interview Ravi speaks in detail about his company. We also have an interview with Dr. Madhulika Guhathakurta who is an astrophysicist at NASA as well as the Lead Program Scientist for NASA’s initiative called “Living with a Star” (LWS). Also we have our regular articles; V P Nandakumar writes about the micro-entrepreneurship route to financial inclusion. Sree Rekha writes about Aurangabad in her travelogue. We also have an interview with Aishwarya Devan, a leading actress in South Indian films Cruise well through the New Year and enjoy your reading. pple Inc’s request for a permanent injunction against Samsung Electronics’ smart phones has been denied. Apple and Samsungs struggle for industry supremacy as they have been involved in the patents dispute. In August it was found that Samsung had copied some of the critical features of the iPhone and iPad upon which Apple had been awarded $1.05 billion in damages. For most of the year, Apple had been successful in its U.S. litigation campaign against Samsung by convincing U.S. District Judge Lucy Koh in San Jose, California to impose sales bans against Samsung’s Galaxy Tab 10.1 and Galaxy Nexus. In October, a federal appeals court reversed the ban against the Nexus phone, ruling that Apple had not presented enough evidence that its patented features drove consumer demand for the entire iPhone. hough for a millennium, white polar bears have roamed the frozen lands of the Arctic, according to two Russian experts, Nikita Ovsyanikov and Masha Vorontsova, the “monarch of the ice” could be extinct in 25 years time due to human incursions into their traditional habitat. Their present population is 20,000-25,000 globally. Both of the scientists feel that hunting and the trade in body parts are the most serious threat facing in the polar bear. The polar bear has been hunted by the indigenous Arctic people including the Inuit and Eskimos in Alaska and Canada and Yupiks, Nenets, Chukchis and Pomors in Russia. “A high percentage of cubs are lost. Females can’t breed. Individuals become famished. Also, there is pollution, oil drilling and increased susceptibility to diseases,” said Ovsyanikov. “What is needed is more lobbying for the endangered animals,” he added. es, you might have seen Nokia’s Lumia Smartphones being sold out in many stores across Europe and America, however it’s just too soon to lay a bet that Nokia is on the road to recovery just yet, as the retailers are saying that supplies have been short ever since the lunch of the Lumia. The positive online reviews of waiting lists for the 920, as well as Nokia’s sales deal with China Mobile, have helped Nokia shares rise over 40 percent in the past month. The Lumia 920 and 820 which was launched just last month was a “make or break” deal for Nokia, who used to be an undisputed leader in the mobile phones industry. However analysts are saying that there is no proof that Lumia phones are making significant inroads on market leaders Samsung and Apple or that CEO Stephen Elop’s risk strategy of betting the company’s future on Windows software was paying off. id you know that warning women that eating chocolate can make them fat may actually drive some to eat more? The joint study of the University of Western Australia with the University of Strathclyde in Scotland found that low restraint eaters meaning those that are not on a diet showed to have a strong impulse to eat chocolate when presented with negative messaging, including warnings that chocolate could lead to obesity, reported News.com.au. This is so because those not on a diet are less preoccupied with regulating their food intake. Researchers found that the dieters shown the ads featuring thin models prompted an increased desire to eat chocolate coupled with greater feelings of wanting to avoid consumption, or indulged in higher consumption and ultimately felt more guilt. This reaction of a warning having a contrary effect is known as “reactance,” according to lead author Professor Kevin Durkin. ueen Elizabeth II, scripted history when she attended a cabinet meeting in 10 Downing Street, becoming the first British monarch since George III in 1781. George I ceased to chair cabinet in 1717. According to BBC’s report the Queen’s father, King George VI had attended war cabinet during the Second World War. Prime Minister David Cameron greeted the 86 year old Queen at the door of Number 10. Once inside, the Queen was introduced to each of the government’s senior ministers who presented her with a gift to mark her Diamond Jubilee after 60 years on the throne. After the Queen and the cabinet had taken their seats, Cameron formally welcomed her to the meeting and outlined the agenda. The meeting started off with Chief hip Sir George Young talking about the change to royal accession rules, to allow a first born girl to become head of state even if she has a younger brother. 36 year old restaurant owner with the surname Bai, came up with an idea which was sure to get him arrested and taken to a nice, quiet prison, reported The Star. Bai went to a supermarket in Taichung city, Taiwan where he clearly stated his plans. He shouted “I am here to rob. Call the police!” he shouted, according to the newspaper. The Man kept yelling and pleading with the workers to call the police. The so called “robber” then bought a pack of cigarettes and went outside. When the police arrive they found him waiting for them in front of the store while having a smoke. Unfortunately for Bai, his plan failed. The police released him once they realized his intention was not to commit a crime that he only wanted to escape his nagging wife. arcelona has announced on their official website that they have reached an agreement with Hernandez Xavi, Carles Puyol on a contract extension until the summer of 2016, while Lionel Messi will stay with the club until 2018. Puyol’s previous deal was due to expire at the end of the 2012-13 campaign, but now it seems that the 34 year old defender will remain for three more additional seasons. Xavi, midfielder originally had a contract with Barcelona until the summer of 2014, and now has reached an agreement for two more seasons. Messi who was initially under a contract with the camp Nou side until 2016, however after his impressive performances in 2012, Barcelona offered him a new deal till 2018. The Argentinean player scored his 89th and 90th goals of the calendar year in a 4-1 rout of Altetico Madrid to extend his world record haul and cement his status as the world’s top player. ritain’s Prime Minister David Cameron has admitted for the fist time that he can indeed imagine Britain quitting the European Union (EU), The Sun reported. Cameron talked of how the prospect of Britain pulling out of the EU after MP’s grilled him about last week’s Brussels summit. When asked if he could envisage Britain leaving the EU, Cameron said “all futures for Britain were imaginable. We are in charge of our own destiny, we can make our own choices.” Cameron, however stressed withdrawal was not his “preference”. He wanted Britain to stay in the EU and to renegotiate relations with the EU (based in Belgium) to seize back key powers. pair of the NASA moon mapping probes smashed themselves into a lunar mountain on Monday, ending a year long mission that is shedding light on how the solar system formed. The Gravity Recovery and Interior Laboratory (GRAIL) spacecraft had been flying around the moon, enabling scientists to make detailed gravity maps. Out of fuel as it edged closer to the lunar surface, the probes were commanded to smash themselves into a mountain near the moon’s north pole, avoiding a chance encounter with any Apollo or other relics left on the surface during previous expeditions. On December 6, the probes nicknamed Ebb and Flow, had flown down to about 7 miles in order make one last detailed map of the moon’s youngest crater. achin Tendulkar, without question the world’s best batsman announced his retirement from One-day Internationals. The batsman from Mumbai ends his career with 49 hundreds, 18,426 runs, 463 appearances, and 96 half-centuries and a world cup win to add to his glory. Sachin will turn 40 in April, exited the 50-over-format rather quietly. The Board of Cricket Control in India’s website announced that Sachin had his decision to the board’s president. The announcement of his retirement was surprising for his fans. Earlier media reported that Sachin had made himself available for selection for the upcoming games against Pakistan. V.P. Nandakumar MD & CEO, Manappuram Finance Ltd.
entrepreneurship. Until fairly recently, it seemed that microfinance was the ideal way to fill this gap. However, recent developments have belied the promise. Is there anything else that would work? Consider this. On Nov.30, 2012, the Economic Times carried a frontpage article with the title “Entrepreneurs Bond with Yellow Metal”. It featured the story of Aneesha Binu, a woman entrepreneur in Idukki District (Kerala) who runs a beauty parlour. Aneesha had set up her business with money obtained by pledging her jewellery. Aneesha, incidentally, is a customer of Manappuram’s Rajakumari Branch, and we have come across thousands of examples like hers. We are familiar with how mobile telephones made things easier for small businesses and services. Earlier, the cost of renting a shop or office space, and waiting for the telephone connection to materialise was a huge stumbling block to the common man who wanted to start off on his own. Now, with a mobile phone, anyone can operate from home and be in business overnight. Likewise, many have dreams of starting something on their own but arranging for adequate working capital is a hurdle. With access to hassle-free gold loans, they can get started immediately, without having to go chasing after a bank. Gold loans promote micro entrepreneurship. In a country with low levels of financial literacy, microentrepreneurs require access to small loans that are readily available without elaborate paperwork and procedure. A gold loan is ideal for this purpose. Aneesha’s example proves that gold loans lower the entry barriers to micro-entrepreneurship. That’s why, today, about a third of Manappuram’s gold loan customers belongs to the micro enterprise segment—traders, shopkeepers, the selfemployed etc. They use gold loans as a hassle-free source of working capital to meet the requirements of day-to-day business. The new generation of India, donot bother to spend some extra money for an expensive coffee from an expensive outlet. ndia was known as the country of tea lovers, but of late coffee lovers are growing in number, thanks to new lounges and cafeterias which serve varieties of Coffee. The coffee culture is much prevalent among the young generation. Students and young professionals throng coffee outlets and spend their free time in the company of their friends. The coffee market is worth more than USD 230 million and as per industry experts, by 2017, the market will be around USD 410. Starting a coffee chain may be the best decision you can now make. As the disposable income in the hands of young generation increases, the more will they spend on. There are several factors which drive the coffee business ahead. First of all the enhanced purchasing power of Indians over the recent years and most of the families go out especially the young ones. The new generation of India, do not bother to spend some extra money for an expensive coffee from an expensive outlet. Coffee shops also become points of social gathering, especially for the techie young generation, free Wi fi and similar connectivity options make these places quite attractive. Apart from social meetings entrepreneurs and businessmen find it attractive to sit in coffee outlets and discuss business. These outlets help them to get a meeting place, with all facilities at a rather small price point. Consider the cost of renting a place and two cups of coffee. These people find this ideal place to meet and finalize a deal. The franchise model helps the brand owners to spread their brand far and wide. The world over franchising methods help Coffee brands reach more customers and the only important factor is to replicate the brands quality and service standards to all locations. Training teams are made and recruitment is done at a central level to maintain the quality and service standards. Almost all major brands operate on a franchise model. opportunity and thus diluted the market. Many brands could not sustain the service demands of the customers and closed down. Another major problem looming is that of an economic slowdown. People like to go out, sit with friends and talk about what is happening in the world. Friends like to meet up in some place and share their friendship. Businessmen will need a place to sit and talk. As long these basic needs are there, Cafeâ&#x20AC;&#x2122;s will be thronged with people. The only thing you need is to sustain the service levels and quality. The smell should be there not only on the cappuccino cup, but also on your faces. A smile can bring you business like a Coffee. 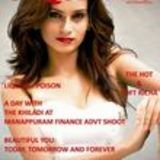 he 10th edition of Manappuram Miss South India 2013 will be held at Lulu Convention Centre, Thrissur on 9th of January 2013. The Pageant aims to discover the freedom of expression and talent of the women of India. This edition of the pageant will bring together the youth of South India and showcase it in its entire splendor, its exciting blend of culture, tourist destinations and natural beauty to the entire world. Cochin. These sessions will consist of yoga, meditation, personality development, catwalk, beauty tips, Photo shoot, Interaction, Talent search, etc.… This will help the contestants to enhance their strengths and overcome their weaknesses. Grooming section will be completely focused on the culture and tradition of South India. The girls are groomed by an expert panel of fashion choreographers and trainers - Mr. Arun Ratna of Fashion Runway, Mr. Sameer Khan of Elite Model Flattt; Ms. Valentina Ravi of Valen’s Model Management, Former Miss South India 1st runner up Ms Geethu Tony Chungath, yoga trainer Ms Nuthan and Jebitha Ajit, MD, Pegasus. The stage for the eve is made to the reality by the team headed by Mr. Diliip of Akshay inco. The handmade Ribbon for the contestants, subtitles and title winners are designed by Mrs. Christeena Jomy, MD of X’tina’s design. The winners will be getting a gold plated crown designed by Mr. & Mrs. Prakashan Parakkat. The title winner will win a Lakh rupee sponsored by Manappuram Group, the first runner up with Rs.50, 000/sponsored by Riti Jewellery and second runner up with Rs.25, 000/- sponsored by MAcare. All the subtitle winners will be given with gifts. Apart from the title winners, the other subtitles to win are Miss Beautiful Hair, Miss Beautiful Smile, Miss Beautiful Skin, Miss Beautiful Face, Miss Beautiful Eyes, Miss Congeniality, Miss Cat Walk, Miss Perfect 10, Miss Talented, Miss Viewer’s choice and Miss Photogenic. The three sequences include the designer saree round, Casuals and Black & black. The subtitles will be judged by a panel of expertise headed by Dr. Thomas Nechupadam. avi Menon joined Sobha Developers in June 2004 as a Director and was designated the Vice Chairman in January 2006. He was appointed the Chairman this year in June 2012. Born in Kerala, he did his graduation in civil engineering from Purdue University, USA with a distinction. In a span of eight years, as an executive member of the Board, he has contributed significantly to product execution which has resulted in the Company’s delivery levels increasing from 6 Million Square Feet in the financial year 2004-05 to over 50 Million Square Feet in cumulative during 2011-12, a new milestone in the history of the Company and the construction industry in India as a whole. During the same time, the turnover of the Company increased from Rs. 6,248.34 Million in the financial year 2005-06 to Rs. 14,144 Million in the financial year 2011-12, an increase of around 125%. He has played a pivotal role in devising the corporate strategy, diversifying through product lines and entering into new geographies thereby strengthening the foundation of the Company. He has been actively responsible for the launch of new product lines and attainment of the highest standards of quality. Under his leadership, the Company has consolidated its operations and become a widely recognized and acclaimed brand. A man of details, he has brought about tremendous value addition to the organization in terms of creating Project Management Information Systems, detailed Technology Manual, elaborate Quality Evaluation Procedure, Customer Care Structure, Innovation Culture, and Sobha Academy, which is focused on the Technical and Behavioral development of all employees. He has been instrumental in strengthening the execution by focusing on micro level tracking of cost, quality and time. Highly organized, he aims to transform Sobha into a system driven organization by documenting each and every process of the Company. His objective is to transform Sobha Developers into an organization of the future. For his dedicated service and achievements, Ravi Menon has been bestowed with the ‘Young Achievers’ Award’ at the Real Estate Awards 2012 and the ‘Star Realty Magnetic Young Icon’ award at the Star Realty Awards 2012. Ravi Menon in a conversation with Bejoy George talks in detail about Sobha and what makes his company distinct. Sobha is known for its quality. How do you ensure the same? Sobha Developers was established in 1995 with a clear vision to transform the way people perceive quality. Today 302 projects later, Sobha is a brand trusted for perfection. Sobha has an in-house Quality & Safety Department, comprising experienced German master craftsmen, that ensures the quality of the product at every stage of construction. courts, restaurants, and research centres. Some of Sobha’s prestigious clients include Infosys, Taj, Leela, Dell, HP, Timken, Biocon, Institute of Public Enterprises, and Bosch amongst others. We understand Sobha has constructed over 50 million sq. ft. of space. Can you provide us with the latest data in terms of completed projects? As of September 30, 2012, in the past 17 years, Sobha has completed 81 residential projects and 221 contractual projects covering about 53.73 million sq. Detailing is the key to the success of our projects including doors and windows, wooden floorings, ceilings, panels, pillars and staircases, and custom built furniture for commercial and residential use. In addition, this division also includes an inhouse wood working design studio and a dedicated design team that provides interior design schemes and production specific drawings. The Glazing & Metal Division carries out metal fabrication work such as aluminum windows and doors, structural, and architectural glazing. The fabrication activities are carried out at the factory premises, whereas assembly and the installation are carried out at the project sites. The Concrete Block Making Division manufactures concrete blocks, pavers, kerbs, water drainage channels, paving slabs and related landscape products. What is the architectural design expertise that Sobha has? conceptual plans are prepared. On approval of concept plans, drawings for marketing and statutory purposes are prepared. This is followed by the preparation of good for construction drawings, which entails preparation of a comprehensive set of drawings, comprising of architectural, coordinated structural engineering and services drawings. On an average, the count of the total number of drawings for a typical residential building would range between 350 to 400 numbers. And, in order to prepare these drawings, approximately 2800 man hours are spent. Detailing is the key to the success of our projects. Many of our details are standardized and well documented. Interestingly, about 40 percent of the total set of drawings are detail drawings. And it is these details that help our engineers to precisely construct all the finer components that make Sobha’s buildings truly world-class. Please explain the measures you take to ensure environmental friendliness in your projects and the different Quality certifications that Sobha has obtained. We try our best to bring in eco-friendly measures at every stage of development. Our commitment to sustainability comes to life through a well-structured management process that is pivoted around the PDCA principle “Plan – Do – Check – Act”. Architectural Design is the process of integrating the Client’s functional requirements with the Architect’s ideas and the environment. Sobha’s Architectural design studio comprises of Architects, Graphic Designers, Model Makers and 3D Visualizers and is equipped with the best of technology. Our attempt is to ascertain the Genius Loci, i.e. ‘the guardian spirit of a place’ during the initial stages of identifying land parcels. We observe and identify the specialties of that place and its surroundings and make every attempt to retain the inherent character of the land. the contours available to create different levels in our plan. This prevents not only soil erosion but also reduces pollution. water management techniques are also used to prevent soil erosion. Many of our developments subscribe to the green guidelines laid down by IGBC (Indian Green Building Council) and LEED (Leadership in Energy and Environmental Design). Such initiatives are highly appreciated by our customers. In all our projects, we lay strong emphasis on environment management practices like rain water harvesting and recycling of waste. More than 40% of our construction area is dedicated to green spaces. A Sobha home is designed for maximum ventilation and natural lighting, thereby curtailing the use of electricity during the day. For instance, the size of the window and its orientation is planned in a manner that reduces the requirement of air conditioning and prevents the glare through direct sunlight. We were one of the first companies in the industry to obtain the ISO 9001 certification. We have also received the OHSAS 18001:2007 and ISO 14001:2004 certifications for our Environmental, Health and Safety Management System. that the customers may require after the completion of the sales process. The C3 provides support to customers during the one-year warranty programme. intense training to make them adept in specific work skills like tiling, granite masonry, gypsum works, water-proofing, electrical, and plumbing works. The Technician Supervisor Model adopted by the Company for on-thejob training at the sites stresses on the importance of hands-onexperience. The comprehensive in-house construction handbook on building construction activities communicates the best construction practices to the execution team across the organization at all the project sites. Additionally, a knowledge management system also offers learning opportunities to the employees. Sobha is known for serving the community. Can you throw some light on Sobha’s CSR initiatives? The Company believes that for the overall well-being of the society, a comprehensive and sustainable development of rural India is a must. It is in this context that Graamasobha, a unique social developmental programme was initiated by the organisation in 2006 in two grama panchayaths Vadakkenchery and Kizhakkenchery in Palakkad district of Kerala. The programme covers key human development verticals like education, health, employment, water, sanitation and housing besides various social empowerment measures.  The Sobha Academy has been created to empower the rural poor to break away from the vicious circle of poverty, ignorance, deprivation and exclusion by providing their children high quality education comparable to the best anywhere in the world.  The Sobha Health Care Center has redefined the limits of a primary health care institution run anywhere in the country.  Sobha’s Hermitage is the epitome of humanity, tendering love, care and support to the neglected segments of society - senior citizens as well as young widows and their children.  Sobha Vocational Training Center (SVTC) with its advanced resources and facilities aims at providing functional vocational training.  The Sobha Community Center’s core purpose lies in organizing social functions and feeding the poor, several of whom are fed free every single day. In the history of Indian villages, our initiatives are perhaps the first of their kind, undertaken with so much investment in designing, developing and delivering state-of-the-art infrastructure to the poorest of the poor. Graamasobha stands as a successful model for others to follow to usher development at the village level. he Samsung Galaxy Note II is an Android Smartphone marketed by Samsung and noted for its combination of a large display, and software optimized for an integral self-storing stylus. Because the display places the device at the large end of the Smartphone and small end of the tablet size ranges, the Galaxy Note II has been called a hybrid of a phone and tablet, or a phablet. he iPhone 5 is the sixth generation of the iPhone and succeeds the iPhone 4S. The phone is a slimmer, lighter model that introduces a higherresolution, 4-inch screen in the series with 16:9 widescreen aspect ratio support. The phone also includes a custom-designed ARMv7 processor called the Apple A6, an update to Apple's mobile operating system known as iOS 6, and support for LTE. okia Lumia 920 is a Smartphone developed by Nokia that runs the Windows Phone 8 operating system. It was announced on September 5, 2012, and was first released on November 2, 2012. It has a 1.5 GHz dual-core Qualcomm Krait CPU and a 114 mm (4.5â&#x20AC;ł) IPS TFT LCD display, as well as a highsensitivity capacitive touchscreen that is covered by the curved Gorilla Glass. It supports inductive charging and is compatible with Qi Inductive Charging; further, it features an 8.7 megapixel PureView camera with optical image stabilization for still images and videos. It comes with 32 GB internal storage. he Samsung Galaxy Camera is a point-andshoot camera which combines the photographic capabilities of a small super zoom camera with the versatility and connectivity of a small tablet computer with 4.8 inch screen, running on Android 4.1.. Samsung announced the camera in August 2012 with the slogan "Camera. Reborn." The camera also features Wi-Fi, GPS and also has 3G capabilities to share the photos from anywhere to anywhere. The Samsung galaxy camera features a 16 Mega Pixels CMOS sensor and 21x zoom. icrosoft Surface is a series of tablets designed and marketed by Microsoft. It was announced on June 18, 2012, by Microsoft CEO Steve Ballmer at Milk Studios in Los Angeles. The Surface comes in two versions: one with Windows RT and another with Windows 8 Pro. The Windows RT model uses an ARM CPU, while the Windows 8 Pro model will use an Intel CPU. Both models are able to install new applications via the Windows Store, however only the Windows 8 Pro model allows the installation of traditional third-party desktop programs. he iPad is a line of tablet computers designed and marketed by Apple Inc., which runs on Apple's iOS operating system. The first iPad was released on April 3, 2010; the most recent iPad models, the fourth-generation iPad and iPad Mini, were released on November 2, 2012. The user interface is built around the device's multi-touch screen, including a virtual keyboard. The iPad has built-in Wi-Fi and, on some models, cellular connectivity. he MacBook Pro is a line of Macintosh portable computers introduced in January 2006 by Apple Inc., and now in its third generation. Replacing the PowerBook G4, the MacBook Pro was the second model, after the iMac, to be announced in the Apple Intel transition. It is also the high-end model of the MacBook family and is currently produced in 13- and 15-inch screens, although a 17inch version has been offered previously. eing the daughter of a RBI Banker, the late Mr. Suchandra Guhathakurta and Mrs. Rani Guhathakurta, Dr. Madhulika Guhathakurta is a Kolkata born Indian native who is an astrophysicist at NASA as well as the Lead Program Scientist for NASA’s initiative called “Living With a Star” (LWS) . Having grown up in an intellectual environment where there were more books in the household than there were furniture, and with a father who was a mathematician by training and a philosopher, Dr. Guhathakurta is an admirer of Tagore’s poetry, and of the night sky which has fascinated her since her childhood. After having received her Masters in Astrophysics from the University of Delhi, she moved to the U.S. at the age of 22 in order to pursue her PhD in Physics at the University of Denver. In 1993 she joined NASA, and in 1998 she begin working at the NASA headquarters, and throughout her career she has had the chance to work as a scientist, mission designer, instrument builder, directing and managing science programs and teacher and spokesperson for NASA’s mission and vision in the Heliophysics Divison. Having achieved much throughout her career, we sit down for a chat to find out more about her and her success as an astrophysicist at NASA. Dr. Madhulika Guhathakurta talks with Denisha Sahadevan about her life and experience in NASA. WHAT IS YOUR SPECIALTY HERE AT NASA? I am an astrophysicist by training and at graduate school I specialized in just one star, the Sun. In my research career I expanded this specialization to include the study of sun’s effects on earth. And today I am the science manager of a program called “Living with a Star” (LWS). HAVE YOU GOTTEN TO DO ANYTHING UNIQUE WHILE WORKING FOR NASA? Heliophysics wasn t even a subject when I studied at the university. It is a brand new discipline which NASA developed. LWS has four missions in various states of operation and development. Together they will surround and explore the sun-earth system in ways no spacecraft has done before. in never-before-seen detail. and we became friends. While in India at Delhi University during my M.Sc., I never experienced this sense of resentment from my male classmates because I did better than them in exams. So the first time I felt discriminated as a woman was in my first few months of graduate school and I thought to myself that I have come from a third world country to a first world country and this is where I feel my first gender discrimination”! But since then I learnt to navigate the situation and never felt discriminated under any circumstance. What I realized is that once you get to know people all of these pre-conceived notions about people/gender etc dissolve and this is true in every situation in life whether it’s religion or race or something else, once you make the effort to get to know someone none of these barriers matter because ultimately we humans are allmore alike than not in our dreams and desires and pursuit of life. India and China seem to be taking more of an interest in the space programs nowadays than the usual players such as U.S., Russia, and France. What is your opinion? I think I am really glad that space is now becoming an international frontier. U.S., Russia, Europe, have already advanced in this area and India, and China still have to catch up to that. So the fact that these countries are taking interest in space science research and leading scientists, and engineers is a wonderful thing. With limited resources in every country I think we need a lot more players in this field. After all space doesn’t belong to any one country, it belongs to all. What are your thoughts regarding India’s space program? knowledge with the general public. That is something that if I were just a pure researcher I wouldn’t have time for. That has been extremely joyful. At NASA, we are privileged to see, to know so many things that ordinary people don’t get a chance to experience – some of our imagery! I came up with a story line to share the LWS program and show some o these exquisite imageries. I helped in the creation of two major planetarium shows, “Cosmic Collisions” and “Journey to the Stars” in partnership with American Museum of Natural History in New York and National Air and Space Museum in DC. I also helped in the production of a 3D IMAX and planetarium show featuring the STEREO mission, “3D Sun”. These shows are running all over the world. Children, general public, older people, are learning something about the cosmos that they had no way of knowing otherwise. So these are some of the highlights, I would say. oday, our society is being infected by an illness that could be dangerously contagious and eventually seriously affect our entire nation. It’s nothing but the irresponsible “blame-game” we all tend to do every time. .This can weaken any one which would reflect on our nation in due course of time. We see people not being responsible on what they do. For instance, for failing in any situation, people often put the blame on others. Irresponsible parents blame teachers when their children do not do well in academics. Politicians blame the opposition party for everything. No one is ready to accept personal responsibility for their own failures. When we fail to accept personal responsibility for our actions, we inevitably fall into the blame-game trap. As long as we do this, we will never resolve our personal or national problems A story about some sea gulls in a fishing village is worth mentioning here. For many years, they were fed on the scraps the fishermen left and when the fishing industry in this area was closed, they had forgotten how to find food for them. In the end, these sea gulls died of starvation. The same principle applies to us too. When we are over-dependent, we destroy our growth and maturity. One of the great principles we need to stress on to keep our society healthy and productive is the principle of personal responsibility. It's a principle that needs to be programmed and etched into our belief system from our childhood. It has to start from the family teaching how to demonstrate at every phase of our lives. This will reflect in our behavior and manners. Though we are not responsible for our upbringing, we are fully responsible for what we become. It is interesting to see how people view responsibility now days. Following examples will make clear what I am trying to convey. "If a man cuts his finger while slicing a mango, he blames the Knife. "If a person is a chain smoker for many years and die of lung cancer, the family of the victim blames the tobacco company. This is the fundamental principle one must adopt if plan for happiness and success in life. In my profession , I have met many who are reluctant to take responsibility for their not up to the mark performances and failures. Do any work assigned gracefully and timely. Give hundred percent commitments in whatever you are asked to do. Be genuine in everything you involve. Some of us are prone to believe that our failures are created by others. What we need to understand is that YOU and I are responsible for what we become. Need of the hour is nothing but personal responsibility. I had undergone orthodontic treatment 7 years back but there are some spaces left in my upper and lower jaw. Some of my teeth look shorter while others are longer/ larger. I am a professional model but I am not able to smile confidently as my photographers always like my non-smiling picture. I do not have time for braces as I am busy with my career. How can I improve my smile? How long it will take without braces? The size and shape of the teeth can be altered by gum contouring and veneers to give you a better smile. The spaces between teeth could be closed by nano ceramic restorations in a single appointment. The gum contouring and veneers may need 2 appointments and maximum of ten days to correct the problems. You can have smile simulation prior to the procedure to understand what can be done for your teeth. My father 78 years old has lost most of his teeth. He has been wearing a removable denture for quite sometime. Recently we changed the denture as the old one were loose. Now he looks different and older and complains that he is not able to chew. Can you fix the teeth permanently. Is it necessary to take out all teeth before doing dentures? When you replace an old worn out denture you will have a fresh look. If you can get the photographs of your father during his younger days, we can try to make the approximate facial profile while making the new denture. The existing healthy teeth have to be preserved to get better retention and support. You may choose to go for implants to permanently fix the teeth to the jaw, if your father has no medical complications. For Amanat, India's brave daughter, Our humble homage. Let justice be done now. What's causing my toenail fungus? Toenail fungus is actually athlete's foot (often picked up from shared showers or borrowed shoes) that has spread into your toenails. The most effective treatment is a prescription antifungal pill, but be warned: These treatments are only 70 to 80 percent effective at best, and even when they work it takes nearly a year and a half for the toenail to fully grow out. Prevent a recurrence by wearing shower slippers every time you rinse off at the gym and by not borrowing shoes. How can I get rid of dark circles? Here are some natural remedies for dark circles under the eyes: one is bananas— the potassium helps eliminate circles under your eyes; the second is by using real lemon juice and honey—it’s a natural lightener as well. Mix one tablespoon of lemon with four teaspoons of honey. Smooth on dark spots or under eyes, wait 15 minutes, and rinse! s a humanities student studying at the Kendriya Vidyalaya NAL in Bangalore, the daughter of Mr. Devan, a bank employee and Mrs. Devan, a homemaker, Aishwarya Devan a fashion fanatic had originally dreamt of becoming a fashion designer. But when a Telugu movie director approached her through Facebook asking whether she was interested in movies everything changed as it led to her taking the first steps into the world of Indian cinema. Having made her debut in the film industry through the Tamil film Yuvan in 2012, this well to do talented actress has already had snatched roles in around six films within the year. She has already worked with big time actors like Prithviraj and Mohanlal, and now her dream is to become a Bollywood queen. How would you describe yourself to be? I am a very silent person when it comes to my work place. I hardly speak to people on sets. It takes some time for me to open up when am working with people whom I haven't worked with before. People call it my attitude but that's how I am, but I see to it that whoever works with me should feel that I am a sweet girl. Otherwise I am a fully outgoing person, I live up to the fullest with my family and friends. What was it like working with Director Bala in the movie The Hit List? I knew Bala as an actor. He is hard working, and talented as well, being able to work with him was too good of an experience. Please tell us about your experience in working with Mohanlal sir in the movie Karma Yodha? I used to watch TV a lot when I was a kid, and I wanted to be like every other actress or model. I wanted people to know me when I step out. industry. Especially my mother. My mother was, is and will be with me in every stage of my life. What differences have you found in your life after having entered into the film industry? After entering into film industry I have become much more responsible, careful, and independent in my life. Life is more colorful. I am enjoying it to the fullest. Who would you say is your inspiration in life? My mother. Do you have any other interests other than acting? Other than acting I love singing.. I love Indian music. Have you signed on for anymore upcoming projects? As of now I haven't signed any. I will take up projects only after January. the story unfolds – of how Pi got his name, his childhood, his early trysts with religions, his life at Pondicherry. Over the course of the day the wonderful story of Pi is told and along with the writer the audience is all awe-inspired about the story. In the end, at the behest of the Japanese insurance company Pi tells a new story that really catches everyone off guard. The US official trailer terms it as a life of adventure, hope, and triumph. The book that talks about faith, illusion, and hope was once dubbed as not suitable for the screen. However, in the hands of Ang Lee that ruling has to be taken back. The very fact that the director can engage the audience with a movie that predominantly has only a sixteen-year old boy and a tiger at sea scene after scene itself bears testimony to the craft of one of the greatest directors of our times. The adult Pi is played by Irrfan Khan and through him the transitions in the movies are well played out. He is like the ‘soothradhar’ found in Indian theatre tradition – helping the audience in finding their feet in this epic saga where faith and hope are put beyond its normal tests and have to meet their spirituality counterpart. The character of sixteen-year old Pi is brilliantly portrayed by Suraj Sharma who with his innocent, lost looks brings out that coming-of-age of a boy whose trip half way across the globe turns out to be a personal journey of introspection. The film that took four years to make already has three golden globe award nominations to its credit and might make it big on Oscar night. ctress Vidya Balan and Disney UTV managing director Siddharth Roy Kapur were married in a quiet ceremony which wove together Tamil and Punjabi rituals. Both the Tamil and Punjabi traditions kept in mind for their exchange of vows in what was a completely privat affair, according to close friends of the couple. The ceremony tok place at the Green Gifts bungalow inupscale Bandra, and was only attended by the couple’s family and close friends. The bride looked simple, and said to have changed her wedding attire thrice. hough this year’s pop charts have been dominated by the younger singers in the industry, it is the veteran music stars, led by Madonna, who are commanding big money in the tour ticket sales, according to a new Billboard list released on Tuesday. Earning an estimated $228.4 million in ticket sales from her sold out ninth worldwide tour in support of her 12th studio album “MDNA,” Madonna, has topped Billboard’s List of Highest grossing live tours. The top five highest grossing tour acts of 2012 included Bruce Springsteen, E Street band, Pink Floy’s Roger Waters, Crique Du Soleil’s homage to the late Michael Jackson, and Coldplay. niversal Pictures and Walden Media announced that Academy Award winning actress, director and producer Angelina Jolie is in talks to direct the WWII drama “Unbroken.” The film is based on Laura Hillenbrand’s 2010 best seller “Unbroken: A World War II Story of Survival, Resilience, and Redemption,” chronicling the life os Olympic athlete Louis Zamperini, who was captured by the Japanese navy and detained at a prisoner of war camp after having suffered a near fatal plane crash and surviving on a raft for 47 days. his director believes that he understands the taste of the viewers so well that he is confident that his films will never fail. Sajid Khan’s three ventures “Heyy Babyy”, Housefull”, and “Housefull 2: The Dirty Dozen did brisk business at the box office. He is very much sure that his next film “Himmatwala” a remake of 1983 will follow to be a hit as well. “I have learned films by watching them, and I make films as an audience member. I know what the audience wants, and that is why my films will never flop,” said Sajid. He has guaranteed that “Himmatwala” will run full house and people will not get tickets for three days. irector Michael Bay debunked the “Transformers 4” rumours, saying that the leaked scrip is not his film. The Plot details from “Transormers 4” emerged on the internet recently. With Bay dismissing the reports, he says only he and screenwrier Ehren Kruger are in possession of the story. “Some internet sites reported that some document recovery guy has found a legitimate 120 page script of “Transformers 4”. I can absolutely 100 percent say this is completely false,” Bay stated. “The upcoming installment of the action movie will feature Mark Wahlbery in the lead role, replacing former star Shia LaBeouf. The movie is due to be realsed in 2014.